Yahoo Messenger is one of the most popular online chat platforms. Though they closed public chat room facility for some unknown reasons, still many users are using it. This article is about certain tools which can tell you the status of Yahoo Messenger chat contacts whether they are online, offline or invisible. 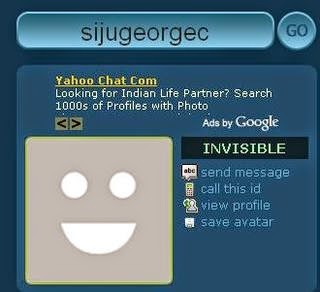 If one user is in invisible mode, Yahoo shows he/she is offline but Yahoo Messenger invisible detector tools can easily tell you the contact is really offline or in invisible mode. So you can find whether the contact is actually doesn't willing to chat you. If the status checker tools tell the user is online and shows offline in your messenger, most probably that contact may block you. Some of the famous tools are ydetector.com, imvisible.info, detectinvisible.com, who-is-invisible.co.cc, ybuddy.info etc. Here you can see how to check whether a Yahoo Chat Contact is in invisible mode. YDetector is a free online tool which tells the status of a YM user ID. If the particular contact is in invisible mode this tool will tell us that user ID is invisible. The below is a screenshot of that tool. Invisible is another interesting free tool available on the Internet. Using this tool too we can check the online status of particular YM ID. Another tool to check the status of Yahoo Messenger User is detectinvisible. The screenshot of an experiment is given below. The tools showed above only work to check the online status of your Yahoo Messenger chat friend. It will show you whether your Yahoo Messenger chat friend is hidden to you or really offline. To check the status of your chat friend in Gtalk we have another method. To know that method click on the link below. Are you interested in finding the location of your Yahoo messenger chat friend in addition to detect the real status of him? If yes, you can find it by following the simple steps specified in the following link. www.invisibleyahoo.net it's very good. just try it. Is there any sort of Yahoo ID cross-reference, to link together all the Yahoo Messenger ID's that a given user may have? The best Yahoo Invisible Detector http://www.detector-invisible.com scanner 100% accurate. -Add new friends , send text messages , see the top visited and checked profiles . Comment at your favorites profiles !